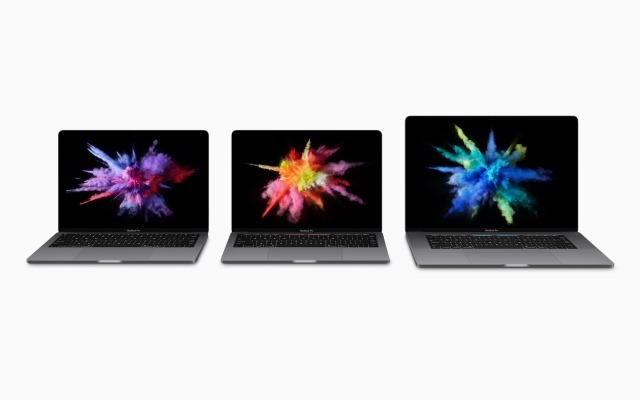 The star of Apple's event today was always going to be the new MacBook Pro. Other announcements may have been made, but they faded into insignificance compared to the latest addition to Apple's notebook range. This time around we see a 13- or 15-inch device with an all-aluminum design. In Tim Cook's words, it is "absolutely incredible". Both models are available in Silver and Space Gray, and it's the thinnest and lightest MacBook Pro ever made. Things have shrunk, things have grown. The new MacBook Pro is thinner and lighter than ever, but the trackpad is now twice as large -- it is huge. But the real show-stealer is Touch Bar. We thought this new killer feature may have been called the Magic Toolbar, but apart from the name change, it's very much what we expected. This is a Retina Display multi-touch panel that replaces the traditional row of function keys. That said, the function keys and Esc key remain, albeit in soft form. Touch Bar is touch and gesture sensitive and includes Touch ID so you can log into your MacBook Pro with a fingerprint. Touch Bar has built in system functions such as screen brightness, and it's context sensitive, so it shows buttons that relate to the current app. Quick type suggestions blends the autosuggest feature of iOS with the features of a regular keyboard, but whether this allows for faster typing remains to be seen. Just as Cortana has a dedicated button in Windows 10, so Siri now has a dedicated button. 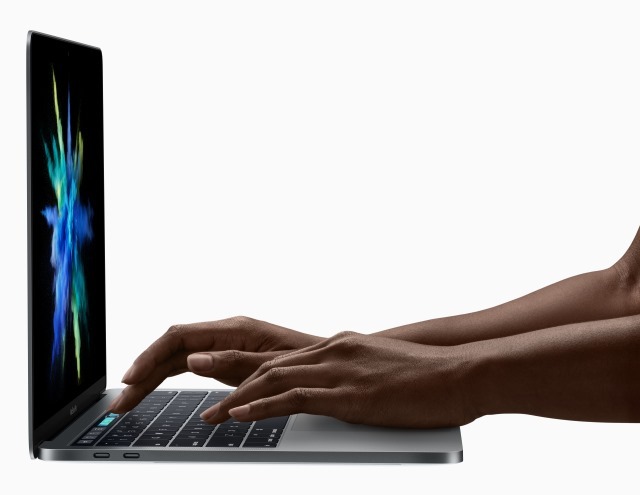 The 13inch MacBook Pro is just 14.9mm thick (17 percent thinner than before), features 23 percent less volume, and weighs just 3lbs -- almost 0.5lbs less than before. For the 15-inch model the 15.5mm thickness means it is 14 percent thinner than before, there 20 percent less volume, and the weight is just 4lbs. Both feature an all-new keyboard design with second generation butterfly switch mechanism. The screen is 67 percent brighter and offers a 25 percent wider color gamut. 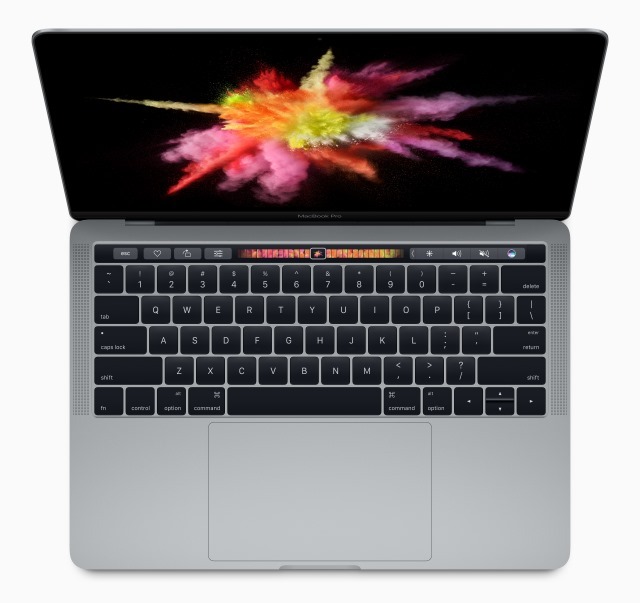 The 15-inch MacBook Pro features an Intel Core i7 Quad-core with 2133MHz memory, supports up to 4GB of VRAM, and includes an SSD operating at up to 3.1GB/s. The 13-inch model comes in i5 or i7 versions. Both models offer up to 10 hours of battery life. Find out more at the MacBook Pro website.